Assistant Professor of Biology Matt Beckman spoke with the Star Tribune about the work he is doing as an adviser to a Breck School senior doing research on 200-year-old pollen samples. Grant Two Bulls, a member of the Oglala-Lakota tribe, won the American Indian Science and Engineering Society’s competition through his work and which is providing a look at the lives of his ancestors when they lived near Lake Calhoun. “Here’s a high school senior doing pretty high-level research and then taking that data and speaking to national audiences about it in a really impressive way,” Beckman said to Kim McGuire, a reporter at the Star Tribune. Learn about another Breck School student, Taylor McCanna, who was coached by David Murr, physics professor. McCanna took second place in one of the most prestigious international science fairs for her work with Murr. Taylor McCanna works in the Augsburg College labs. 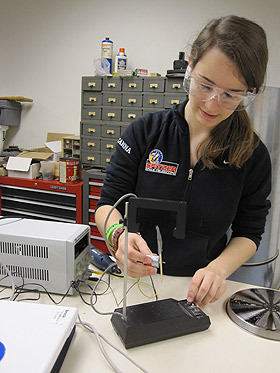 She developed six prototypes of a field mill before creating a device that could measure the global electric circuit. Success often comes after repeated failure. That’s one of the key messages learned by a young scientist who worked with an Augsburg physics professor to place at the largest international science fair.